For as long as I can remember, despite my mom’s pickling and jamming under my nose, pickles have sounded like an intimidating kitchen project. 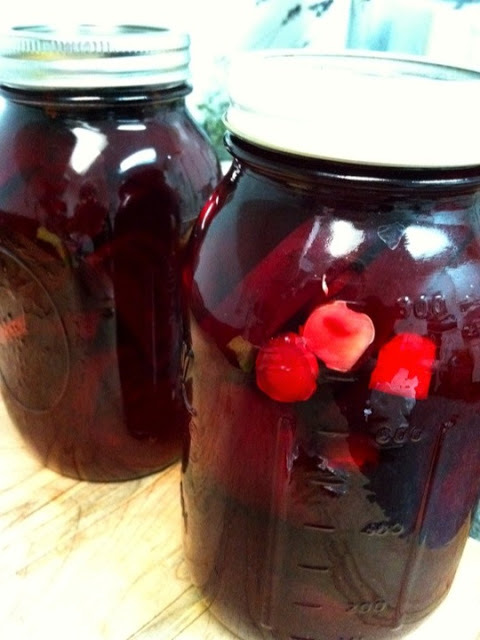 Well, I’ve learned a thing or two over the past year from my fermentation friends and gurus, including these easy-as-pie and jaw-dropping-good refrigerator pickled beets! These add the most gleeful pizzaz to any salad, mid-day snack and other recipes to come. They come packed with flavor, so dressings and other adornments can be kept to a minimum. Give it a whirl! Slice the roots and leaves off the beets, and scrub the beets to remove any dirt. Fill one large pot with water, and submerge the whole beets. Bring the water to a boil, and boil the beets for about 30 minutes. While the beets are boiling, sterilize the jars. Fill a large pot with water and bring to a boil. Submerge two quart glass jars and caps in the water and boil for 10 minutes to sterilize. Remove with tongs and place upright on a tea towel or hot pad. Check to see if the beets are done by sticking a fork in the biggest beet. If it slides in easily, they are ready. 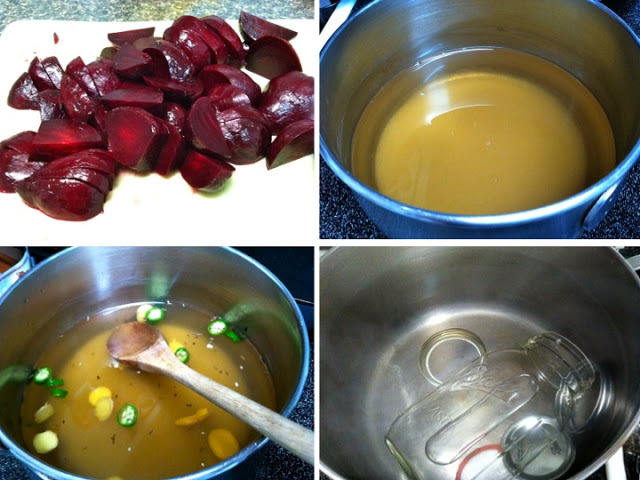 Remove the beets and rinse with cold water to cool them quickly. Peel the skin off the beats with your hands - the skin will slide right off. Cut the beets in quarters. Fill each jar 2/3 of the way up with beets. 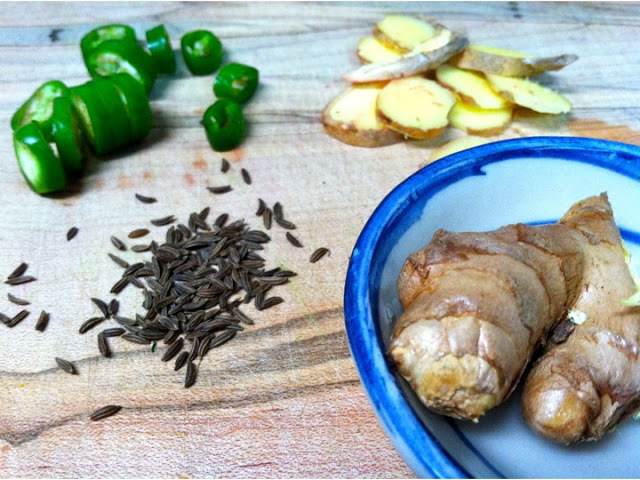 Next, bring the sugar, water, vinegar and your spice combination to a boil (I suggest one jar of each!). 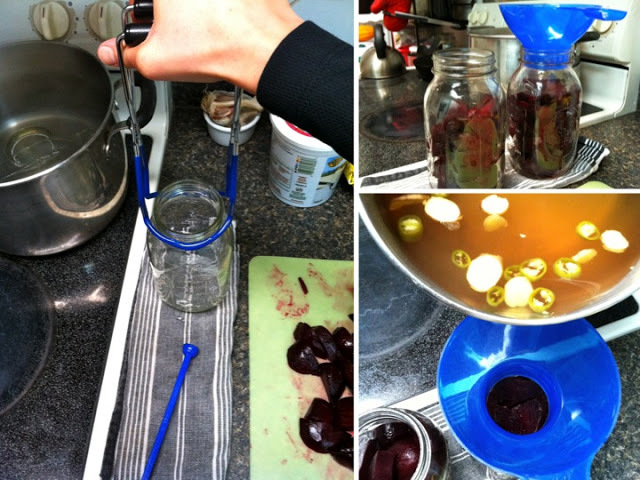 Pour the liquid into the jars (you can use a funnel), covering the beets entirely. Seal the jars with the caps, and store them in the refrigerator for about 4 days before sampling. After four days, start devouring!